Welcome to Highline Trail RV Park! Highline RV Park is located just south of Boulder, Wyoming at the base of the Wind River Range. We have 47 sites with full hookups, including four buddy sites for those traveling with friends or family. With over four acres of open lawn, you also have the option to dry camp or tent camp. And if you didn't bring your own tent, no problem! Enjoy a stay in our teepee or wall tent! From our park you can explore the lakes and back country of the Wind River Mountains, spend time in Pinedale, make a day trip to Jackson and Teton National Park, or simply relax and enjoy the peaceful setting we offer. We're also in a great location for those going to and from Yellowstone. We'd love to be your destination, or a stop along the way. Give us a call to make your reservation today! We're 12.5 miles south of Pinedale and 89 miles north of Rock Springs/Interstate 80. Address: 8718 US 191, Boulder, WY 82923. 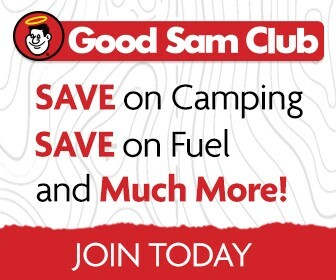 We're a proud Good Sam Club member! Not part of the club yet? Click below to join! Call to reserve a site for The Green River Mountain Man Rendezvous. July 11-14,2019. Always the 2nd Full Weekend in July. Show up as strangers, leave as friends.